Scenes like the one above have been more common this April. Sparsely attended ballparks have been a relatively common sight at the start of this baseball season, which has inevitably led to the obligatory round of articles lamenting the sport’s decline. Instead of jumping to a knee jerk conclusion, CNBC’s Darren Rovell actually took a look at the early season attendance figures and reported only a small 1% decline. According to more recent data from Baseball-reference.com, the drop stands at 2.5%, but still nothing indicative of a major negative trend. Although any decline shouldn’t be dismissed, such a low percentage can easily be explained by a variety of variables, especially when the sample size is only two weeks. For example, there have already been 12 rainouts, as noted by Maury Brown, and that doesn’t even take into account the unseasonably cold weather that has plagued much of the country. 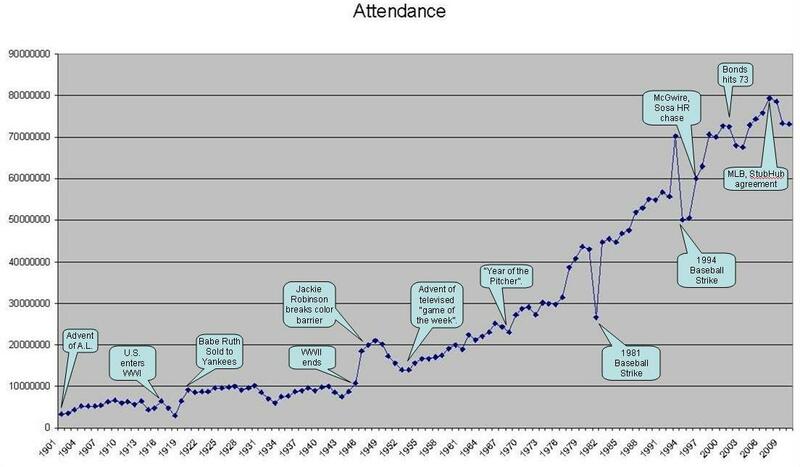 Before the season started, Commissioner Bud Selig expressed optimism about baseball breaking its current attendance record of 79.5 million, which was set in 2007. Since then, however, the number of fans filling the seats has slowly declined. The slumping U.S. economy has likely played a significant role in this gradual pullback, but it seems as if another development over that time period may also be to blame. 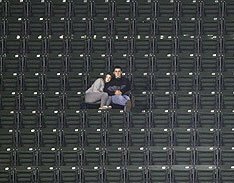 In August 2007, MLB made its first league-wide foray into the secondary ticket market by signing a five-year deal with StubHub. Before the agreement, several teams permitted season ticket holders to resell tickets, but the exclusive partnership with StubHub not only consolidated the efforts, but also created unprecedented transparency in the secondary market. From a fan’s perspective (at least those who aren’t season tickets), the development of the secondary market has been a major positive. Instead of having to rely on scalpers or less trustworthy means of online distribution, like Ebay and other auction sites, fans can now safely obtain tickets to just about every game played in the major leagues. What’s more, not only has transparency increased, but the rise in availability has led to a corresponding drop in prices. In many cases, tickets for non-premium games sell on StubHub at a significant discount, especially as the event date draws closer (StubHub has an optional algorithm that ensures this). Even tickets for popular teams like the Yankees can be purchased at bargain basement prices. For example, seats in section 415 of Yankee Stadium (vs. Chicago on April 28), which have a game day price of $30, are currently selling for $3.80 on StubHub. Even with the approximately $10 in fees per order, the final cost in the secondary market can often be much lower than buying a ticket from the box office. Not only has the secondary market had an impact on game day sales, but it has also affected season tickets. In the past, the main incentives for buying a season plan were access, discounts, and post season purchase options. Since the advent of a sanctioned secondary market, however, all of the benefits have either been mitigated or eliminated. What’s more, the increased transparent supply of tickets has made it more difficult for sellers to attract inflated prices. Whereas in the past a Yankees’ season ticket holder could recoup a significant portion of their cost by selling games against the Red Sox and Mets, the market has pushed the price of even premium contests below historical norms. In other words, owning season tickets is fast becoming a thankless proposition. Needless to say, the secondary market hasn’t worked out as well for the teams as it has for the fans, an issue that could come to a head when baseball’s agreement with StubHub expires at the end of 2012. Unless the rights fees are increased enough to compensate teams for the obvious cannibalization that seems to be occurring, it would make little sense for baseball to renew the current deal. A possible alternative might be for baseball to set up its own secondary platform, which would allow the teams to earn additional fees on tickets already sold. A proprietary platform could also be used to impose price floors and establish earlier cutoffs for secondary sales (options that could also be imposed by a new agreement). These measures would not only protect the value of the season ticket holder’s discount, but also force game day sales back to the team’s box office. If baseball does decide to terminate the secondary market, or create its own using more restrictive conditions, it then runs the risk of alienating its fans. In other words, the powers that be have a very difficult decision to make. Although ticket sales have remained healthy despite recent declines, the sport can’t take its popularity for granted. A robust secondary market should be a good thing, so one of the key issues ahead will be ensuring that the benefits are spread around to all parties involved.